Kate Harris has been writing and editing various media types for over 12 years and has been published in several newspapers including the "Linden Herald," "Kuna-Melba News," "Idaho Statesman" and "Copper Herald." She graduated college in 2001 with honors while earning a Bachelor of Science degree in biology and a minor in chemistry. Bananas are the most popular fresh fruit consumed in the United States, according to the Centers for Disease Control and Prevention. They are inexpensive, convenient to consume and widely available year-round. Often referred to as a "super-food," the banana is packed with vitamins, minerals and amino acids. Take a closer look at the nutrient values of a banana, based on a medium-sized banana ranging from 7 to 7.88 inches long. This size banana weighs approximately 118 grams and has 105 calories. When shopping for bananas at a grocery store, the most common type found is the Cavendish banana. This species is noticeably ripe when the peel turns bright yellow and remains firm. As the fruit over ripens, the skin turns brown and becomes soft. The most prevalent mineral found within the banana is potassium. 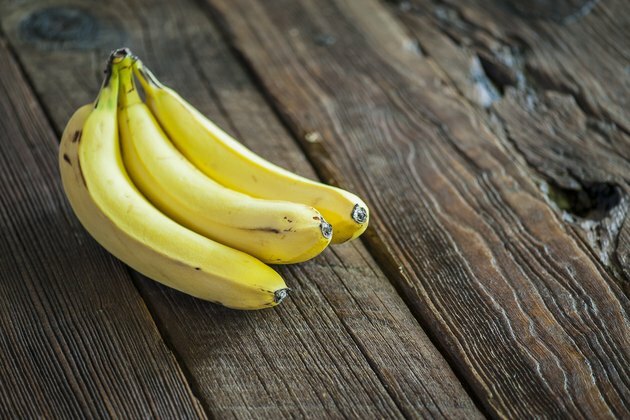 One banana contains over 400 mg of potassium, which accounts for more than 10 percent of the recommended daily intake, or RDI, based on a 2,000 calorie diet. Other minerals present in significant quantities include 32 mg magnesium, 1.2 microgram selenium, 26 mg phosphorus and 0.31 mg iron. Minerals present in trace amounts include calcium, sodium, zinc, copper, manganese, fluoride and selenium. Bananas contain many vitamins in substantial as well as trace amounts. Those found in substantial quantities include vitamins C and B6. One banana contains 10.3 mg of vitamin C, or 10 percent of the RDI, and 0.43 mg of vitamin B6, 20 percent of the RDI. Vitamins present in smaller percentages include thiamin, riboflavin, niacin, pantothenic acid, folate, choline, betaine, vitamin A, carotenoids, lutein, vitamin E and vitamin K.
Amino acids are fundamental building blocks in the human body, used in the production of proteins and essential in cellular metabolism. The human body is composed of 20 amino acids but is able to synthesize only 10 of those. The 10 amino acids that must be obtained from food are arginine, histidine, isoleucine, leucine, lysine, methionine, phenylalanine, threonine, tryptophan and valine. Bananas contain all 10 of these essential amino acids. A deficiency in any amino acid can result in the degradation of the body's proteins and muscles. Department of Agriculture and Department of Health and Human Services: Dietary Guidelines for Americans, 2010, 7th Edition; December 2010; Page 76.